Living in the digital age is a wonderful thing. With so much advanced technology at our disposal, we are now able to do so much with just a few clicks of a button. Smart technology has infiltrated all aspects of our life – from home to office to the great outdoors, there is a piece of smart tech for everything. One of the greatest aspects of the technology we have now is the endless possibilities for entertainment. Whether you feel like watching a movie after a long day or playing a video game with players from all around the world, there is always something to suit everyone’s tastes. Live streaming technology has become increasingly advanced over the past few years and many industries have reaped the benefits of it, one of which being the online gaming industry. When we think of poker, lots of us imagine an exclusive James Bond-esque scene of tuxedos, cigars, casinos and martinis. However, these days the scene is set to change quite a bit. Live streaming on platforms such as Twitch has proven to be highly successful when it comes to playing video games such as League of Legends or DOTA 2 which can attract millions of viewers per live stream, and now it is set to take over the world of online casinos. 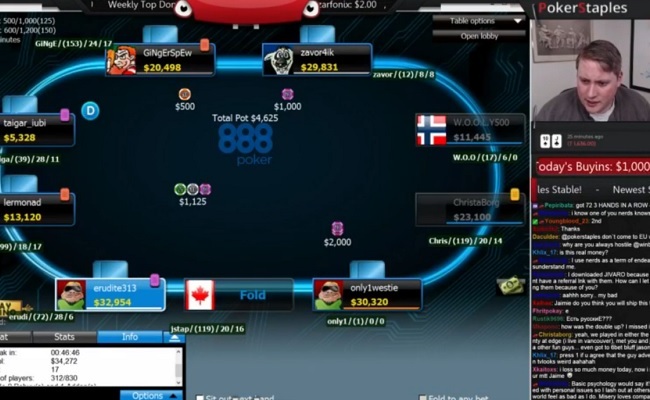 Playing poker online in the past has consisted of computer-generated cards and a basic chatroom to talk with other players; however, advancements in technology have led to this format seeming somewhat primitive by comparison. By being able to live stream real-life poker games to millions of people from all around the world, the way we play poker is set to change forever. SNG stands for Sit N’ Go tournaments which require between 2 to 360 pre-registered players to sign up to a game and as soon as enough players have registered, the tournament will begin. These tournaments are great for players who don’t want a big commitment of playing for hours on end, as these SNGs can be finished within just an hour. Typically, the top three players in a game will be rewarded with cash prizes and the top player will receive a greater payout. MTT stands for Multi-Table Tournaments, and these are much higher stakes than SNGs. To play these, you must buy in to the game for a set price around $10.00 and you could be playing with thousands of players. These tournaments can go on for hours on end and will end when the last player is left standing and they will get a massive cash sum of thousands of dollars. According to 888poker, these are the big tournaments for players, so expect tension. Heads Up poker tournaments are games which are made up of just two players but they are high intensity. Any even amount of players can play a Heads Up tournament but there will only be one-on-one games, and they will continue until one champion is left standing. They can also go on for some time and they are nail-bitingly intense to play and watch! Poker Satellite tournaments are different from the others listed here as they have low buy-in prices and the prizes for these games are tickets to the higher buy-in games such as the MTTs where the cash prizes are very rewarding. Now that you have an idea of what the different kinds of live stream poker tournaments are, it’s time to get some tips and tricks to help you on your way. Firstly, it’s important to know that there are three stages to all kinds of poker tournaments, these being the beginning, middle and late stages. In the beginning stages, you need to set the right bet according to the table size and be sensible. You also need to know when the right time to fold is and be sure to never let your stack fall below 10BB. Knowing when it is the right time to fold or go all in is crucial to a successful game. In the middle stages of the game, you should have prepared a tournament strategy to help give you a structured way to play. This way, you will feel much more confident in the way you play and it will help you stay on a winning track. Coming up with a plan to beat weaker players and get onto the heavyweight table will vastly improve your chances of walking away with a handsome winning prize. By the late stages of the game, it’s time to get aggressive. Nobody’s ever won by playing nice, so it’s time to bring out the big guns and don’t pull any punches. Try to get your timing right and don’t rush into any big moves or you could get knocked out, and you’re sure to increase your chances of being the winner. Virtual Reality has seen great amounts of success since it properly took off a few years ago with releases of devices such as the Samsung Gear 360, and we are still discovering new ways of utilizing the technology. Of course, VR has taken the gaming industry by storm and the same goes for the casino industry. Along with live streaming, VR poker is another hugely popular avenua as players can create avatars and play as if in an on-land casino with players from all around the world. The Steam store offers popular VR poker games and they allow the user to feel immersed in a realistic poker experience while getting to play with players from across the globe. The future of live-streaming poker is a bright one; it has breathed new life into the casino industry and has brought players from all walks of life together to play for fantastic prizes and enabled more people to hone their skills and improve their games.